Highly recommend. Please look closely at the closeup images. There is a combination of aqua and navy, creating the overall teal look. They are beautiful, but if you're looking for overall aqua or teal, keep looking. I'm adjusting my bedspread to match because I like these curtains so much! Create a cozy room for sleeping with these handsome blackout panels. Add this panel pair to the bedroom to block out light, so you can sleep late, or add them to the family room to create a darker room for movie night. The panels feature grommet tops for fast and efficient hanging. These curtains are not 100% blackout but rather room darkening curtains. In the room where they are being used it gets the job done. I ordered the blue color and it is a combination of a dark and light teal, which is really lovely, and the fabric as well is of great quality. Something to take into consideration is the size in the description is not the size of each panel that is the size of both panels combined. All in all this was a great purchase. The color is darker then pictured they are darker blue with slight greenish blue. I think they are high quality for the price. They are truly blackout curtains, I replaced my curtains that I paid a small fortune for from ******* ******* that are very pretty but didn't darken the room. Since we live at the beach and our room gets afternoon sun, these do the trick. These are very nice curtains..The material is soft and feels good quality, they are room darkening and the color (Taupe) is perfect with my living room decor..I have a charcoal sectional and taupe rug with turquoise decor..The background color of the curtains is a very light gray and the taupe design is a dark taupe blended with a lighter one so it just brings everything together..Anyone who has neutral color theme in the room where this is going, get this.. I very much like these drapes; the size and color is perfect for my great room. I have no problem with the product itself. However, I wish the picture would be annotated to indicate that it displays more than one pair. The actual panel has 6 grommets. I'm pleased with these curtains. They're thick and do a good job blocking light. I wasn't very sure of the color from the pictures. The blue curtains are a sort of grayish white, with the pattern in navy blue and a light green color (sort of the color of the Statue of Liberty - I'm not sure what color name would best describe it). From afar, it looks kind of like a light turquoise, which is what I was going for, so it works for me. My only complaint is the threads hanging off of them, but they're easy enough to trim. These curtains are good quality and really block out the light. They look fantastic! My only issue is the width. They look wider in the photo and even though I took measurements I needed a second pair for my living room window. They don't hang as wide as they are due to the grommets. I was disappointed in the fact that the photo is NOT what you receive. The photo shows 8 grommet holes leading you to believe these are longer. They in fact only have 6 grommets. I do like them; however, I will be needing another set of panels just to cover my window... just to note if you think you are getting a GREAT deal. I ordered 2 sets of panels for my French doors. They block out the sun perfectly but the hemline is uneven on all 4 panels making them look as cheap as they were. Good Quality but the pattern is actually two Blue colors. A dark and a sky blue. So a little misleading as I thought they would be all navy pattern. The fabric for these curtains is beautiful, but the colors displayed in the photos are not accurate. I ordered the charcoal, in the photo it looks very light gray, but they came in and the pattern was black. The fabric is nice and they hang well and look great! Keeps the room darker, warmer and quieter. The fabric of the curtains is beautiful. Just what I wanted! The problem is that the grommets are not rubbed bronze as stated. They are all silver. I purchases these because my rods are bronze. Now I will either have to return the curtains or have the added expense of purchasing new rods! Loved not only the look but the price! 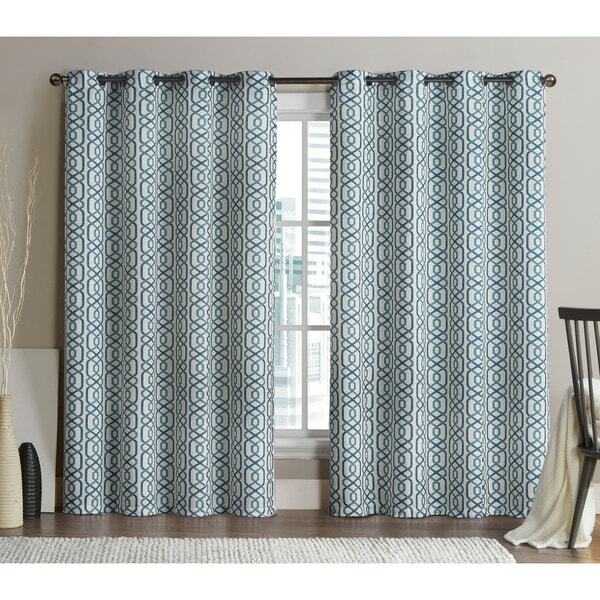 Was looking for curtains that looked great and modern without breaking the bank as I needed 6 panels total, these were just what I was looking for! Love these curtains...very good quality and very pretty. "In previous answers to the question “what color are the grommets?" They are silver. I hope it helps. "Is each panel in the set 52” wide?" "Could you tell me what color the grommets are? I have a bronze rod and didn't want silver. Thank you!" Hello DesB, the grommets are oil rubbed bronze. Thanks for shopping with us! "What is the diameter of the grommet hole please? 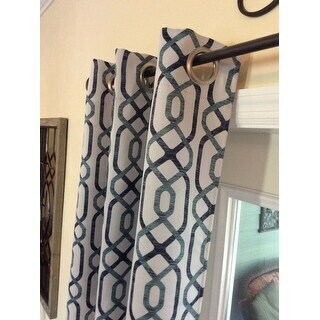 I don't want to purchase pole hardware that won't accommodate the curtains. Thank you!" Hello JulieB, the grommet holes are approximately 2 inches in diameter. Thank you for shopping with us! "Will you be getting more in the Charcoal? I bought 2 sets that I have installed but it is not full enough and need 2 more sets. I am a little paniced because I have already hung the first 2 sets. Help." Hello Dana Z., items are restocked as they become available; however, we cannot guarantee an item will be restocked. Thank you for shopping with us! "Just want to make sure these are priced and sold in a set?" Hello Ronda M., two panels are included with each order. Please let us know if you have additional questions. Thanks for shopping with us. "I also can't tell which is charcoal and which is taupe. Is the curtain with the darker, brownish/bronzish pattern the taupe? Must know before ordering." Hello lzkuhn, the taupe option is the brownish option and is pictured in the middle image. The last image, that is more grey is the charcoal option. Thank you for shopping with us!